Controlling moisture movement in foundations is important for several reasons. First of all, people don’t like water in their basements. However, excessive moisture can also lead to high humidity levels, mold growth, or even rot. One of the methods of controlling this moisture is to dampproof or waterproof the foundation walls. Unfortunately, the terms dampproofing and waterproofing are often used interchangeably in foundation construction, but they mean different things and they are handled differently. Waterproofing is necessary to keep liquid water away from the foundation. Dampproofing is necessary to protect the foundation from the moisture that is present in damp soil, even if liquid water isn’t present. The best way of keeping liquid water away from a foundation is to divert downspouts away from the house, and slope the ground away from the house. In that way any rain, snow melt, etc. will not drain down into the soil near the foundation. For any water that does drain down into the soil near the foundation, and also for any excessive ground water already in the soil from a high water table, a perimeter drain tile and stone or gravel backfill has been the standard approach. This is a waterproofing system. When liquid water gets into such a gravel backfill, it quickly runs down into the drain tile and is diverted away through a pipe either by gravity or a sump pump. When a drain tile is used, but soil is used for backfill, the water can’t drain away as quickly, so it tries to drain through the foundation wall. If enough liquid water is present, hydrostatic pressure will force it through any opening it can find in the foundation wall, no matter how small. The purpose of the stone or gravel backfill is to relieve the hydrostatic pressure. With the correct backfill material, the liquid water will travel the path of least resistance: through the backfill into the drain tile, rather than through the foundation wall. Today there are various fiberglass or plastic drainage mats available that work just as well. They are a half inch or so thick and are very porous. By placing them next to a foundation wall, when liquid water gets near the mat, it quickly runs down through the mat into the drain tile. When the soil is merely damp, as it often is, liquid water isn’t the problem. 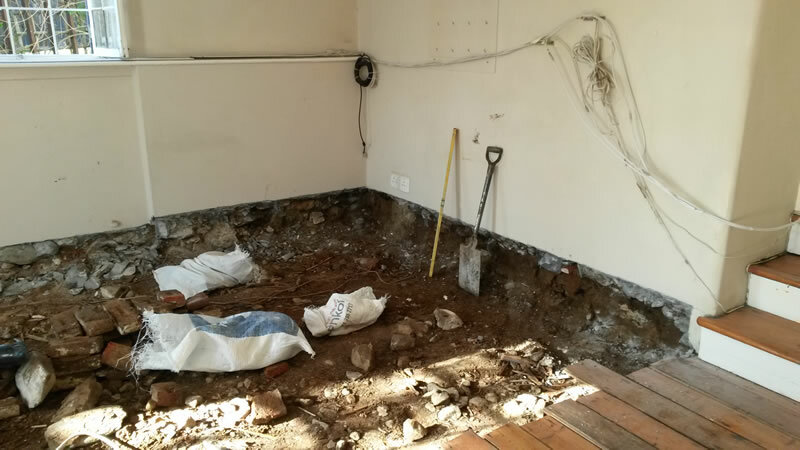 When damp soil is next to a foundation, it will cause the foundation to get damp. The dampness will work its way through the foundation wall and eventually enter the basement or crawl space. Concrete and masonry are actually very porous, so dampness can move through such materials fairly easily. (This is done through a process called capillary action.) Once the dampness reaches the interior surface, it can evaporate into the basement or crawl space, increasing the moisture in the air. To stop the dampness is relatively easy because, by not being in liquid form, there is no hydrostatic pressure. A simple foundation coating will do the job. This coating is called dampproofing. It isn’t a substitute for waterproofing. If there is a small hole in a dampproofing coating, very little ground moisture will find its way through to the foundation. However, that is not the case if liquid water is present under hydrostatic pressure. Quite a bit of such liquid water will flow through a relatively small hole. Even if a perfect dampproof coating, with no holes, could be applied, it would not be a substitute for waterproofing. This is because foundations settle over time, which could lead to minor cracks in the coating. Even the process of backfilling can damage a coating. If the purpose of the coating is dampproofing, a little damage isn’t a big deal. If the purpose of the coating is waterproofing, a small hole or crack can mean water in the basement or crawl space. One place where dampproofing can be a good idea, but is seldom applied is on the top of a footing. Dampness in the soil can rise up through the footing into the foundation wall from below. Once the dampness is in the foundation wall it can rise up and evaporate into the basement or crawl space. By coating the top of the footing, a dampproofing barrier is created that isolates the foundation wall from the dampness of the soil. For a dry basement or crawl space, both dampproofing and waterproofing are necessary. The waterproofing is best handled by relieving the hydrostatic pressure of the liquid water and directing it to a drainage tile. Dampproofing can be accomplished by a simple foundation coating. To rely on a dampproofing coating to perform as a waterproofing system is foolish, because it isn’t designed for that purpose.